The process of moving can be made much easier, if it’s done in a precise and productive way. Here are five territories of your home to clean up before you move. Beginning in these zones will enormously decrease the measure of stuff you take with you from your current home to your new space. Don’t wait for the last minute to start declutter your home. Don’t put it off to eventually just throw the stuff away at your new place. Get rid of the stuff you no longer use or need, it will save you a lot of time and energy when it comes to packing and eventually unpacking at your new place. Start in the smaller areas of your house, taking a look at a house loaded with stuff you have to deal with can be extremely unsettling. This is the reason you have to begin small. Concentrate on zones like your room, the bathroom or your living room. If you declutter your closet well before you move, you can use large plastic containers to pack away off-season items. Remember to label those containers as well and add them to your moving key. Go through your kitchen and throw out anything with an expired date or that has gone stale. Get rid of any cookbooks you haven’t opened in the past year, and any strange kitchen gadgets you really don’t use. I suggest cleaning out your pantry 3 days prior to your move so that you still have the essentials you’ll need before ‘D’ day. Clean out your pantry by emptying it shelf by shelf. Go through expiration dates and staleness. If you are sure you won’t use something and it is still fresh, you can donate it to your local food pantry. Plenty of people can benefit from the things you no longer want or need. Dispose of any expired meds, place the items you wish to keep in a clearly marked container so that it will be easily recognized by you if needed. Basements & garages are usually ones ‘keep safe’ place for stuff we really no longer need or use. Be true to yourself when you start to declutter. There is no need to save your grown kids art project from first grade, get the family together and let them come chooses what they would like to keep and get rid of the stuff no one wants. 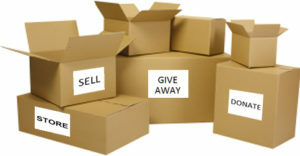 When decluttering use three large cardboard boxes: Labeling them trash, donate and keep. Using a system to declutter will help you visualize how much you have, and it often helps people feel better about throwing things out and giving items away.